After four straight seasons of the road team winning, Marquette (8-2) bucked the trend with a 74-69 win over No. 12 Wisconsin (8-2, 2-0 Big Ten) in overtime at Fiserv Forum. Here are my five takeaways from Milwaukee. From the outset, the Badgers worked their offense around Ethan Happ as he made four of his first five baskets. Field goals were not the only thing Happ impacted. The senior’s skillset was on full display as he added 11 rebounds, four assists, three steals and two blocks, capped off by a game-high 34 points. No matter if it was Sam Hauser or Theo John guarding, Happ dazzled his way with post moves that would make Frank Kaminsky proud. Despite Happ’s 34 points, Marquette coach Steve Wojciechowski made the adjustment to not double in the second half and the results were immense. Wojciechowski gave credit to Happ for being consistent despite the different looks thrown at him. “Ethan Happ is a handful,” Wojciechowski said. “He is truly one of the great players in college basketball. I hope fans at Wisconsin appreciate him because guys like that don’t come around very often. Joey Hauser’s first taste of the rivalry with Wisconsin turned out to be a good one as notched 15 points, while Sam delivered a double-double with 13 points and 14 rebounds. The Hausers’ ability to make a combined 5-of-8 three-point makes allowed for proper floor spacing to occur and took some of the scoring load off Howard. 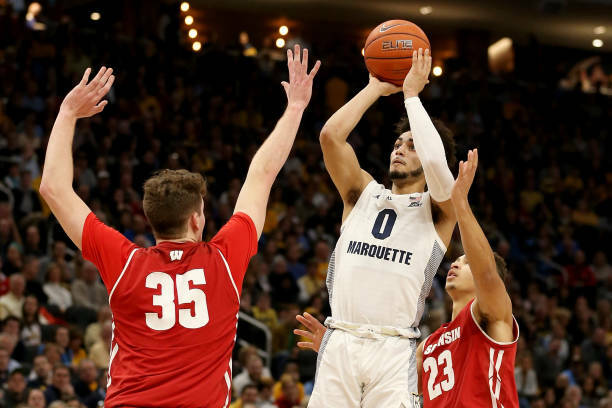 Despite getting to the foul line more this season, the question would be how Marquette would fare with attacking more towards the rim in a big game. Even with six straight missed free throws, Marquette finished 22-of-34 overall, compared to Wisconsin’s 10-of-21, in a game where the largest lead was six points. The Big East’s leading scorer at 22.8 points per game coming into Saturday added to his total with a team-high 27 points, on 12-of-15 free throws. Even with Howard’s shooting woes at 7-of-29, the junior finished with his fifth 20-point effort this season. Known for his timely shooting on the perimeter and consistency from the foul line, Wisconsin’s Brad Davison looked the complete opposite on Saturday. The sophomore could not get into a rhythm as he went 0-of-3 and missed all 3 three-point attempts and three free-throw tries, despite a Big Ten-best 90.5 FT percentage. To put the icing on the cake, Davison would be assessed a technical foul at the 3:35 mark in the overtime session. Joey Hauser would make both free throws to put Marquette up 67-63. Barring any injuries, expect both teams to be in the NCAA Tournament discussion come March as this edition of the rivalry showcased the best of what the state of Wisconsin has to offer in college hoops.